At least 160 people are feared dead and scores more injured after a church building collapsed during mass in Nigeria. The incident happened at Reigners Bible Church International as worshipers were attending a Saturday prayer service in the southern city of Uyo, Akwa Ibom State. Local reports suggest the church was undergoing renovation work. In the hours after the tragedy, the death toll rose dramatically, with the director of University of Uyo Teaching Hospital revealing that at least 160 people died in the incident, AP reports. Hospital chief Etete Peters also told AP that mortuaries at the treatment facility are overflowing with bodies, adding that the number of casualties is likely to rise. On Sunday, a photojournalist who had visited a Uyo morgue described chaotic scenes. “Dead bodies are stacked on top of each other because there is no space,” the journalist told Reuters. “I saw dead bodies with limbs missing." A resident of Uyo, Gary Ubong, also described to the news agency how he had seen “more than 100 bodies” being taking from the scene of the collapse. The exact number of fatalities and injuries has not yet been confirmed, although police spokesperson is reported to have stated that 27 people are known to have died. Two days of mourning have now been declared in Akwa Ibom State, with President Muhammadu Buhari expressing his “deep sorrow” over the tragic incident. Any tragedy that affects any part of Nigeria affects all of us. Our thoughts and prayers continue to be with the people of Akwa Ibom. I pray that the souls of the deceased will rest in peace, and that the injured will experience quick recovery. Emmanuel was at the church at the time of the collapse but did not sustain any injuries. “We appeal to all citizens to remain calm, pray for the injured and avoid undue speculation as the situation is being given the best possible attention,” he said. Former Nigerian Vice-President Atiku Abubakar said the incident was one in a series of building collapses in Nigeria and implored authorities to improve construction standards. 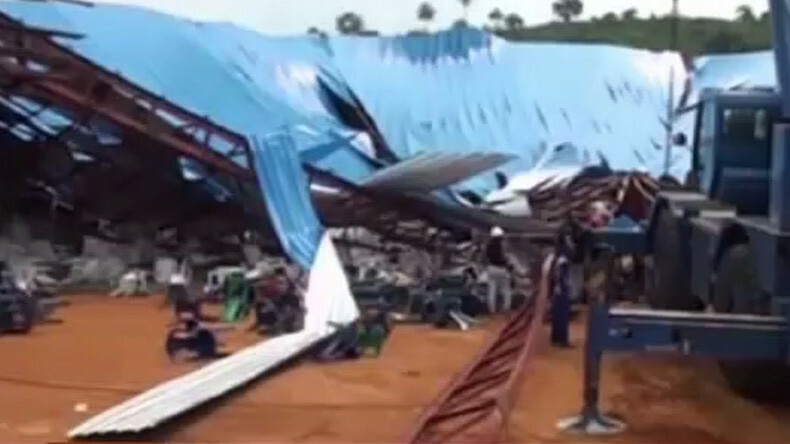 An investigation into the cause of the collapse is expected to be overseen by the local state government. A multi-story Church of All Nations Synagogue collapsed in 2014, killing 116. The incident, which happened in the city of Lagos, was later blamed on structural faults at the site.